The German Grand Prix made a triumphant return to the F1 calendar last year with excellent attendance on race day, and has now been confirmed to remain on the calendar in 2019, largely thanks to Mercedes Benz, which is headquartered in nearby Stuttgart, becoming title sponsor. The long forest section may be gone, but the spectating opportunities in the purpose-built Hockenheimring stadium are now much better and the race is well organized. 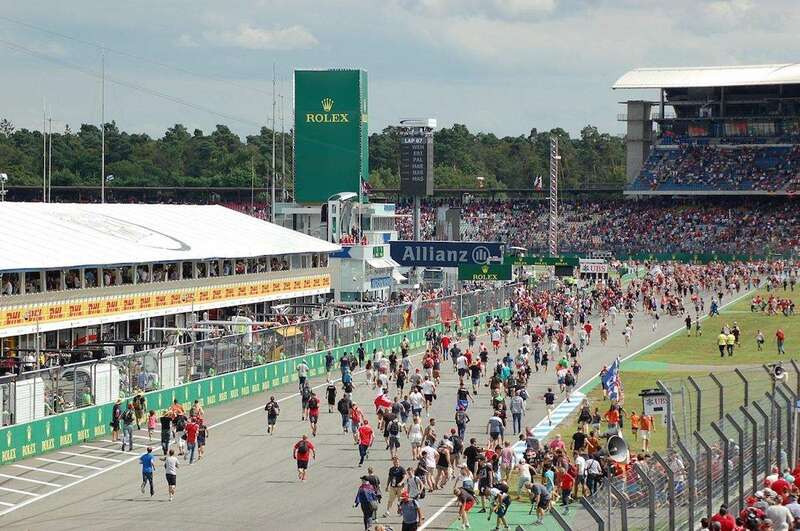 Just five main grandstands are on sale at the Hockenheimring, but there are seven ticket categories; in general, the higher up in the grandstand you are, the more you will pay. All images f1destinations.com. The Editor attended the 2018 German Grand Prix. Support the ongoing development of this site by buying your F1 tickets from our partners, Gootickets. We receive a small commission when you buy using the links on this page. We don’t apply any markup, so you’ll always pay the cheapest price! We also recommend Official Ticket Packages from F1 Experiences. 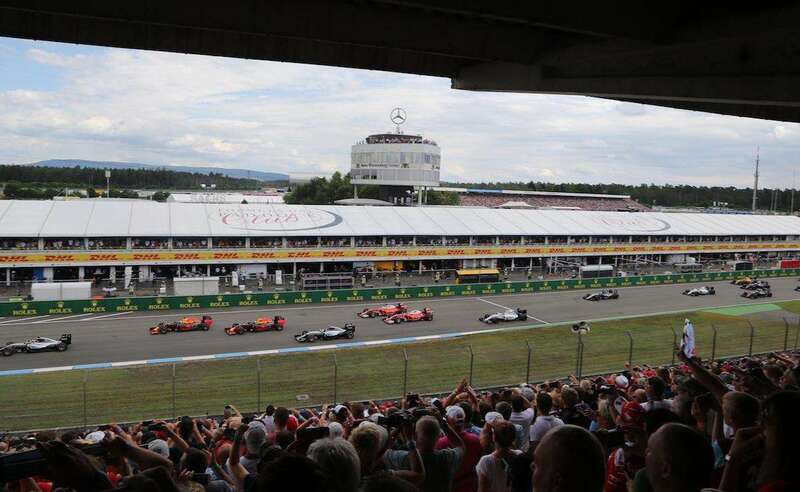 F1 Experiences offers select grandstands and VIP access to the Champions Club and Formula 1 Paddock Club™ at the 2019 German Grand Prix. Hero Ticket Packages include a seat in the Main Grandstand plus a host of exclusive additional benefits such as a Drive the Track Tour, Exclusive Pit Lane Walk and Paddock Club Party with a current or legendary F1 driver (see 2018 pictures above). Champions Club Ticket Packages include full hospitality, guided paddock access & more! Sunday-only tickets are available, but prices are only €20 cheaper than 3-day tickets. Children aged up to 6 years old get free entry to the circuit, but cannot occupy a seat. Discounted grandstand tickets are available for children aged 7-15, costing €45 for Sunday and €50 for the whole weekend. Hockenheimring offers Free Friday, with free seating in the grandstands on Friday, July 26. There are some restrictions however. You’ll need an equivalent ticket to enter one of the following higher-priced grandstands: Main Grandstand, South C/D and High, Mercedes upper deck. The Main grandstand (Haupttribüne) is located on the start-finish straight. If you are keen to see what is happening in the pits, plus the race buildup, start and podium celebrations after the race, then these are the best seats. Choose a different grandstand if you want to see on-track action. The Mercedes grandstand is located between turns 8-10, but you’ll be able to see the cars from as early as turn 5 (Parabolika). You should be able to see some good passing moves here during the race, especially on the hairpin (turn 6) and into turn 8. On the downside, the Mercedes grandstand is further from the best off-track action in the F1 Village. Although most spectators at the Hockenheimring sit in the stadium grandstands, there are several standing areas around the circuit worth checking out, especially near the Parabolika and Spitzkehre hairpin (turns 5-7). If you are feeling really adventurous, you could also take a walk to discover the old circuit, last used in 2002, which is slowly being consumed by the forest. Click here for views of all grandstands and viewing areas at the Hockenheimring. The most expensive tickets at the Hockenheimring are sold for the Südtribüne Oberrang, the highest Yellow section of the South grandstand on the final corner. The elevated views from this corner are excellent; depending on exactly where you sit, you should have a good view of the final corners from Mobil 1 kurve (turn 12) through to the Sudkurve (turn 17) and down the main straight. Lower down in this grandstand, the C-D sections offer better views than A-B, whilst the H is great for the race build up, start and podium celebrations after the race. The best sections of the North grandstand (Nordtribüne) are the higher Blue B & C sections closest to the opening corner, which provide an excellent view for the race start; remember Felipe Massa rolling here in 2014? The A section is better for the pits action and race build up. “The best grandstands in my opinion are the Nordtribüne B and C and the Innentribüne B and C. The Nordtribüne B and C are on the first corner; you can see the start, plus all of the pitlane. The Innentribüne B and C are on the Sachs curve in the middle of the circuit.” Svenja Reber: 2016 German GP trip report. The Inner grandstand (Innentribüne) is located on the Sachs curve (turn 13) and offers views of the last few corners of the circuit, but not the start-finish straight. The lowest section in this grandstand is the main General Admission area at the circuit. Been to the Hockenheimring? Leave a comment with your recommendations! Hi what tickets do I need to buy at the hockenhiem ring for the German F1 if I want standing near the Parabolika and Spitzkehre hairpin (turns 5-7). Buy a seated ticket which also allows access to those areas? What are these General Admission tickets? Do you get any dedicated seats with these and if yes where? You do not get a dedicated seat with General Admission, just entry to the circuit. « F1’s weekend format – what’s the winning formula?